While in operation, a properly designed fluid-film bearing delivered an adequate supply of cool, clean, lubricant experiences no wear. The rotor and bearing surfaces are completely separated by a lubricating film. However, some bearing wear occurs during transitional periods such as unit start-ups, shutdowns, and rotational reverses. At start-up, wear occurs until an adequate lubricant film is formed between the rotor and bearing surfaces. At shutdown, wear occurs from the time the lubricant allows surface contact until the rotor comes to a complete stop. This wear is more pronounced in vertical machines (machines with a vertical shaft), or in other applications where the thrust bearing is under continuous load. Flat surfaces ensure that the load is evenly distributed across the entire thrust bearing surface. In operation, nominal peak pressures of 2.5 to 3 times the bearing unit load are common, and the lack of flatness, along with limited lubrication at start-up and shutdown, can lead to much higher localized pressures and bearing distress. 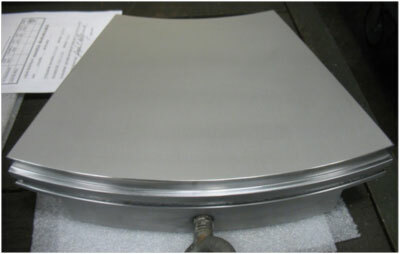 Thrust shoe and rotor flatness are commonly achieved by a lapping operation once machining is complete. In addition to ensuring flatness, lapping has the added benefit of creating the desired surface finishes (32 Ra micro-inches (0.8 Ra microns) or better on the shoes, and 12 - 16 Ra micro-inches (0.3 - 0.4 microns) on the rotor). In spite of the bearing surfaces being flat and possessing the desired surface finish, large thrust bearings, particularly those in loaded vertical applications, will continue to experience wear at start-up and shut down. The soft babbitted surface will yield and conform to the rotor. The greater the number of starts and stops experienced by a machine, the greater the wear, and the better the conformity between the mating surfaces. While some degree of conformity is beneficial, the surfaces will eventually wring together, leading to bearing distress. In order to begin rotation, the unit must not only overcome stiction - the static friction between the rotor and thrust shoe surfaces - it must also overcome the stick-slip phenomenon associated with flat, loaded bearings. "Stick-slip" refers to the rotor overcoming stiction, only to have the movement interrupted as the stiction threshold increases beyond the available dynamic forces. The dynamic forces grow again and overcome static friction, leading to more movement. Heat is generated. This cycle may occur several times during a unit start, and is often accompanied by an audible sound from the thrust bearing. The stick-slip phenomenon is created, in part, by the limited availability of lubricant between the rotor and bearing surfaces. The better the contact between the surfaces, the more limited the lubricant becomes. 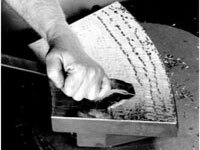 "Hand Scraping" refers to a process that involves using a tool (hand or power scraper) to ensure thrust shoe flatness. It is typically applied to thrust bearings that are loaded at start-up and/or shutdown. Scraping is a time-consuming process that provides benefits that are well worth the effort. Scraping is performed by methodically using the tool to scrape short, shallow pockets into the babbitted shoe surface. The process is performed in a series of passes at a specified orientation to one another, ensuring the required finish while preventing creation of a lubricant escape path. 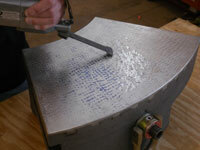 The surface is typically checked against a blued thrust runner or precision surface plate. The process is repeated until contact is evident across the entire thrust shoe surface and established criteria for the range of contact points (per square inch) and depth of the shallow, scraped pockets are met. 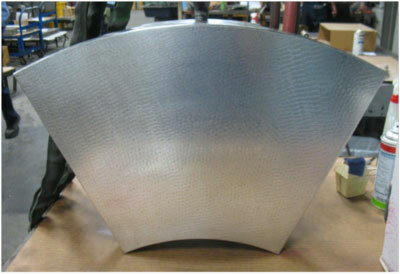 It ensures that the babbitt surface plane is very flat, so the shoe surfaces will uniformly contact the rotor surface. It provides shallow isolated pockets in the babbitt surface that retain oil and improve lubrication at start-up and shutdown. Rotary lapping machines have size limitations; scraping may be applied to any size shoe and ensure flatness. While ensuring flatness, a multitude of shallow pockets are created between the "high" contact points. Experience has shown that these pockets reduce or eliminate stick-slip and the audible groaning which occurs when starting a heavily loaded bearing. 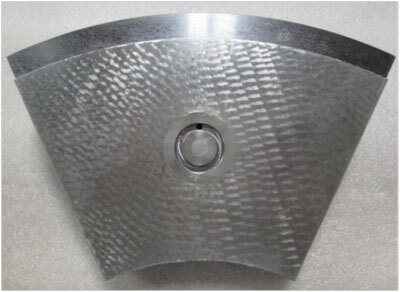 A hand scraped finish is commonly used in vertical machines since the thrust bearing is always loaded. Similar to shoes finished by lapping, scraped shoes also experience wear at start-up and shut down. However, the lubricant trapped in the pockets adjacent to the contact points helps to protect these points until additional lubrication is available. In order to eliminate all rotor-to-bearing contact and the resulting wear, high pressure (HP) oil is often introduced between the bearing and rotor through specially-machined thrust shoe surfaces. The HP oil separates the bearing and rotor during unit starts and stops, thereby eliminating contact and wear. It is common practice to scrape the surface of thrust shoes prepared for HP oil. Although this is generally unnecessary, it provides a level of confidence should the HP lubrication system fail or become unavailable. Scraping, when properly applied, does not compromise HP lift performance. In addition to eliminating wear, introducing HP oil between the rotor and thrust bearing surfaces provides other benefits. Start-up torque requirements are significantly reduced. Some maintenance and assembly tasks are much easier, since the rotor may be rotated slowly, sometimes even by hand. For more information on how Kingsbury can service and improve your existing bearing application, please contact our Repair & Service sales engineers.